The Shoebox: is a story about family, about place, about a sense of belonging and a need to know. It is about growing up as a girl in 1930's rural Australia, about breaking out on your own and travelling full circle to find answers to questions over sixty years old. It is a story about a shoebox left in a shed for half a century and how coincidently it is given to the youngest child of a tragedy, answering some of the questions that she has pondered over and over for the majority of her life. 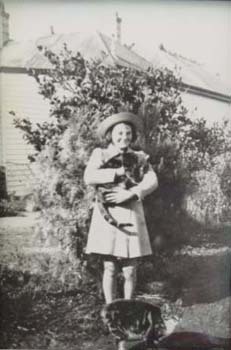 The Shoebox is an interactive documentary about Heather, who was born in the wheat fields of the Wimmera in central-western Victoria, Australia in 1930. Orphaned at just 10 years of age, Heather and her two older sisters were placed in a series of boarding houses hundreds of kilometres away from their extended family. Over sixty years later Heather is unexpectedly given a shoebox that has been stored in a shed for more than half a century. This shoebox contains documents that provide answers to many of her questions, yet it also opens up a number of other mysteries. Divided into six panoramic scenes the documentary evidence and story are gained by the user connecting with the piece in a number of ways. These connections are both passive and interactive and as such the work plays with notions of non-linear narrative and traditional linear story telling devices. It takes the form of a biography using interviews, voice-over narration, re-enactments, animated stills and primary source documents to show how fragments of memory, treasured from a life of loss and absence, become the threads from which a life story is woven. When a World War I veteran, who has been blinded in one eye on the battlefields of France, drives his car into a tram, he is killed. He leaves behind a wife and three daughters. It is 1937. Tragically three years later the girls' mother is also killed by a mysterious illness. The girls, Gwendoline 17, Marjorie 14 and Heather 10 are put under the guardianship of their father's brother, Uncle Jock, a stock and station agent who lives in Kaniva, north-western Victoria. A silence descends over the family as the old ones feel it is best not to upset the girls by talking about their unfortunate situation. Uncle Jock insists the girls are not to be separated. Yet it is World War II and accommodation of any sort is very scarce. So they are boarded hundreds of kilometres away in a succession of houses. For Heather, the youngest, it is a dozen homes in eleven years. With only scraps of information and two small photographs she ponders her origins and the cause of her mother's death for over sixty years until unexpectedly, at the age of 72, she is handed a shoebox containing documents that fill in some of the pieces of her story.